The 16th Annual Run For All Ages 5k is Saturday November 4, 2017 at 10:00 AM. The first 250 runners registered will receive a race shirt, and they tell me they still have some left. Age group prizes will be awarded across all age groups – in five-year increments from 60+. Enjoy a fun post race party with lots of raffle prizes. All of our friends over 80 can register for free! Online entry fees are $22.00 for adults, and $10.00 for youth 13 and under (plus processing fees). Omni Running is a sponsor for the 4th year in a row with the My First 5K Medal. My First 5K medals are great for first time 5K runners of any age. I’ve seen father and son teams where the son was older than me! I’ve also seen moms and dads running with their young children. It truly is a Run for All Ages. My First 5K medals will be available at the race for $10 plus tax. We accept credit cards. Proceeds benefit the Wakefield Education Collaborative. Bring your child, friend or spouse along and make sure they get a great medal to celebrate their First 5K. This is the race that gave me the idea for this medal. 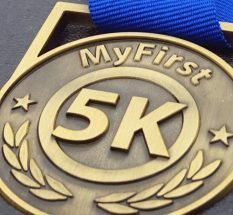 Everyone running their First 5K deserves a medal, even if they don’t place in the top 3. Every child who decides to run their first 5K deserves a medal worthy of their initiative and effort. Show your child how proud of them you are with a very special medal that only a few will receive on race day. This race provides medals for the top three finishers in each age group, but not for all runners. Each year Harrows Chicken Pies is at this race. They make the best chicken pies you’ve ever had. If race day is cold, nothing beats a sample of hot chicken pies!